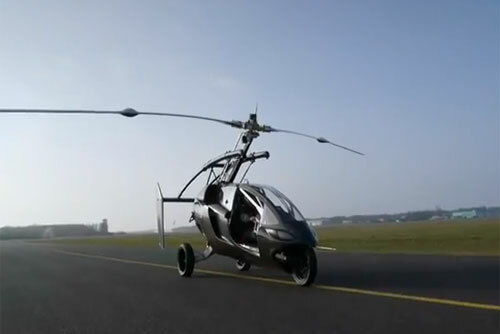 The so called "PAL-V (Personal Air and Land Vehicle)," is the first Dutch flying car makes a successful maiden flight that could change the way of transportation technology today, flying like a gyrocopter. The Dutch National Aerospace Laboratory and Delft University engineers are the developers of the first prototype flying car that can allowed anyone to travel on both land and air traffic. 350 km (220 miles) to 500 km (315 miles) - It depends on the type and pay load. The first flying car runs on gasoline and alternate version that uses biodiesel or bio-ethanol. The first prototype car has a three wheeled vehicle that joined the comfort of a car with the physical appearance of a motorcycle, and later on I think they will developed 4-wheeled vehicle. Government in the US and in Europe has already funded the programs for infrastructure of ‘digital freeways’ to provide safe corridors using GPS technology ( the technology is to allow personal air traffic to grow safely). Try to watch this video below on how PAL-V takes the first take off. According to report, the company (PAL-V Europe) is now welcoming new investors to fund the development of the commercial product. As they initially funded the project and also received a loan from the Agentschap NL, they're now open for the larger market launch. Comments or suggestions about "First Dutch Flying Car successful on maiden flight - PAL-V" is important to us, you may share it by using the comment box below.